The Comcase range has three models to suit any budget and specification. Protection of computer equipment from theft and harsh industrial environments by encasement or cabinets will secure your IT investments. As we all know IT is part of everyday business life. Disruption of your computer systems can cost you dearly in terms of hardware, downtime and most importantly your valuable data. Complete encasement of a PC is the most effective method to help prevent and deter theft, tampering and wilful damage. 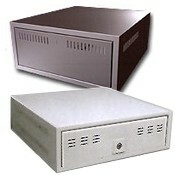 Enclosing a PC also offers security to disk and CD drives, power and reset switches. As an added bonus your equipment is also protected against accidental damage, splashes and dust. You can minimise that risk of losing your data at much less cost than it took to accumulate it by protecting with a Comcase.